In an incident 'transcending' state borders, three men and a girl 'trapped' a rice mill owner from Jakhal town in this district and demanded a ransom of Rs 2.50 lakh from him. Rajan Gupta, who owns a rice mill at Jakhal, a town bordering Punjab, was going to Lehra (Punjab) on his car on Monday. A unique initiative by industrialists in Haryana, for setting up a hazardous waste management facility near Faridabad, has been delayed for over a year. The project, which was to become functional in the first quarter of 2006, has failed to take off. What are Bhajan loyalists up to? Are the systematic resignations of loyalists of former Chief Minister Bhajan Lal from the Congress a part of the campaign to put pressure on the high command or is it a sort of “agni pariksha” set for them by their mentor? Rohtash Godara, sarpanch of Gadli village in the district, is an illiterate person. But his performance as sarpanch has been worth emulation for others. Some new facts have come to light in the infamous Sarva Shiksha Abhiyan scam in which district project coordinator Ram Kumar Beniwal and clerk Suresh Kumar were booked under the Prevention of Corruption Act. In a significant judgment, a local court has imposed a fine of Rs 5 lakh on a woman, who had made a frivolous complaint against her in-laws for dowry. The state government has waived off interest on all kinds of loans to provide relief to debt-ridden farmers and other poor sections of society of the district. With this, the government has waived off Rs 40 crore interest on loans pending with the farmers. Indian Oil Corporation (IOC) today got the possession of land spread over three villages for its petrochemical hub here.District revenue officer Jaidev said the land had been acquired in Baholi, Balajatan and Dadlana villages. 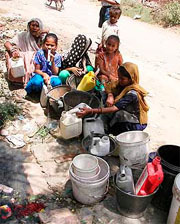 Residents of Mohra Mandi in Ambala Sadar are facing acute water scarcity. Local residents said they were getting inadequate water for the past couple of days. They demanded that the water supply to their area should be improved immediately.They demanded that the water supply to their area should be improved immediately. Thieves stole Rs 2.20 lakh from the dicky of a motor cycle in Pansari Bazar, Ambala Sadar, this afternoon. In an incident 'transcending' state borders, three men and a girl 'trapped' a rice mill owner from Jakhal town in this district and demanded a ransom of Rs 2.50 lakh from him. Rajan Gupta, who owns a rice mill at Jakhal, a town bordering Punjab, was going to Lehra (Punjab) on his car on Monday. He had just crossed over to Punjab when a youth identified as Amit asked for a lift. After covering some distance, Amit requested Gupta to give lift to the girl, who was ostensibly waiting for some vehicle on the roadside. When the car covered some more distance, a Tata Indica car coming from behind overtook Gupta's vehicle and forced him to stop the car. Two youths descended from that vehicle and one of them, Jasbir Singh, after introducing himself as a reader with senior Punjab police officer, started threatening him for trying to seduce the girl. Rajan found that Amit and the girl, sitting in his car, were members of the gang, which had been blackmailing him. The youths demanded Rs 2.50 lakh for settling the matter. Rajan took Major Singh, another accomplice of Jasbir, to his mill on the pretext of making payment and asked him to wait and informed the police. The police arrested Major Singh but as the crime had been committed in Punjab area, handed over the accused to the Punjab police. The Lehra police station, which registered an FIR yesterday, arrested Anita Sharma, a resident of Moonak in Mansa district of Punjab. SHO Lehra Surender Singh said it was handiwork of an organised gang of criminals. He added that a manhunt had been launched to arrest the remaining accused. The project has been caught in legal wranglings after a mining contractor in Faridabad claimed that a part of the land allotted for the waste management project ( about 13 acres) was initially leased out to him for mining of minor minerals. He said he had submitted an application for the renewal of mining lease with the department of mines, Haryana. The matter is now pending before the Punjab and Haryana High Court. As a result, thousands of tonnes of hazardous industrial waste generated by the industries in the state , continues to be disposed off in an unscientific manner. It is estimated that about 20,000 metric tonnes of hazardous industrial waste is generated in the state each year. The union ministry of environment and forests had ordered that all states set up hazardous waste management facilities, for safe disposal of such waste. About 40 different kinds of industrial and bio-medical wastes were identified, and classified under the Act, which require special treatment before their disposal. It was thus that the industrialists in the state got together and formed a society, Haryana Environment Management Society, for setting up and running the project. The society, which now has over 800 members, was allotted about 31 acres of land on lease by the Faridabad Municipal Corporation, on an annual lease of Rs 27 lakh. The Haryana Pollution Control Board was to act as the facilitator for setting up the waste disposal facility, which will have provisions for scientific storage, treatment of waste, secure landfills and state -of-the-art incinerator for disposal of hazardous industrial waste. The different kinds of waste, after being transported to the facility, will be treated to neutralise their toxicity, before this is disposed off either in the landfills, or in an incinerator. Once the disposal facility in Faridabad becomes operational, the entire hazardous waste like flammable liquids and solids, waste which can be explosive by chemical reaction, organic peroxides and corrosives generated by petro-chemical, electroplating, iron and steel industry, sludge from sewerage treatment plants, oil and gas production companies and sludge from textile and dyeing units etc, will be lifted from all over Haryana and disposed off here. It is learnt that half the total area of the site will be used for making special landfills and for installation of an incinerator. The total cost of the project is Rs 20 crore, and this disposal facility will be established in a phased manner. A techno-feasibility study had already been conducted by Senes - a Canada-based company. The commissioner and secretary, environment, and chairman of the Pollution Control Board, Haryana, D S Dhesi, says that though the facility is located at a considerable distance from residential areas, adequate measures will be taken to check that toxins from these hazardous waste do not pollute the underground water. “We will frequently check that seepage from disposal site does not cause pollution of ground water,” he said. While sympathisers of Bhajan Lal and his MP son Kuldeep Bishnoi, who has been suspended from the Congress maintain that the resignations are spontaneous, his detractors, however, assert that the resignations are being sought from the loyalists to test their sincerity towards the father-son duo. Bhajan Lal’s critics say Bishnoi, who has made no secret of his plans to float a separate political party, is not sure of his support base in the Congress. To test the loyalty of his father’s supporters, Bishnoi is making them quit the Congress so that when he forms his own party before the next Lok Sabha elections, they will be in political wilderness. Such Bhajan loyalists would have no other option but to join Bishnoi’s new outfit, argue his critics. Bhajan Lal’s supporters are not hesitant to sit in “Agni Pariksha” as they have nothing to lose. In the present set up of the Haryana Congress, most of those who have quit have already been marginalised. They do not see any future for them in the Congress. As working president of the Haryana Congress Dr Ram Prakash says there are many leaders in the Congress who have played their innings and have lost all hopes of getting the party ticket in future, irrespective of the fact who is controlling the party at the state level. Many of those, he points out, who had announced their resignation from the party in the past few days, could not get the party ticket in the Assembly elections though their mentor, Bhajan Lal, headed the Haryana Congress at that time. How can they hope for the party ticket in the next elections when the sitting MLAs would have a better claim over them? Dr Ram Prakash said Kuldeep had done to Bhajan Lal what even the enemies of the latter could not do. If Bhajan Lal had continued to the party President and had remained committed to the Congress, AICC President Sonia Gandhi would have given him all due respect in the party. He said Sonia, who could show grace to the son of Jatendra Prasad, who had contested the party election against her, by making him an MP, would have certainly not show disrespect to Bhajan Lal. No enemy of Bhajan Lal could persuade him to quit the party post. But Kuldeep, in his hurry to become the Chief Minister, succeeded in doing so. Dr Ram Prakash said it was wrong to say that the high command remained silent when Kuldeep was abusing Chief Minister Bhupinder Singh Hooda alone. The fact that the high command approved the list of those office-bearers who were not to the liking of Bhajan Lal. The high command did so because by that time Kuldeep had already started his campaign against Hooda. But the high command did not go to the extreme because of respect for Bhajan Lal. To save his membership of the Lok Sabha, Kuldeep obviously wants to be expelled from the party. When he realised that the criticism of Hooda was not helping him in achieving his aim, he started abusing Sonia, who had to suspend him in the interest of party discipline. Efforts by Godara helped the village become the first village in the district to attain 100 per cent results in the total sanitation campaign (TSC), a drive launched under the Central Rural Sanitation Programme of the ministry of rural development. The scheme is being implemented through the district rural development authority, Fatehabad, and the Centre has sanctioned Rs 502.89 lakh. The scheme is aimed at making all villages free from open defecation besides making the village lanes free from filth and garbage. The scheme also aims at utilisation of solid waste of villages by converting it to organic manure. The idea behind the scheme is to make villages Nirmal Grams (clean villages). The development authority provides a grant of Rs 1,500 per family living below the poverty line for the construction of latrines. Besides, the development authority also provides funds for the construction of community latrines, latrines in anganwadis and schools in villages. Families above the poverty line have to construct their latrines from their own resources. Godara says it is not difficult to convince people for a good cause, but it only demands concerted efforts, which he did. It is learnt that the confessional statement given by Beniwal and Suresh to the police regarding the receipt of commission of Rs 6 lakh is not with the police. The statement is an important evidence against them. Not only this, it has been mentioned in the complaint lodged by city magistrate Baljeet Singh on behalf of the deputy commissioner that the duo had admitted that they received the commission and gave in writing on March 31 that they would deposit the amount in the Red Cross fund by April 1. However, Rs 10 lakh was deposited in the fund in two instalments on April 1 and 6. Interestingly, Beniwal had orally confessed of taking Rs 10 lakh commission before the ADC and the DC. Many an eyebrow has been raised over the contradiction between the amount admitted in the confessional statement and subsequent deposit of Rs 10 lakh in the Red Cross fund. Interestingly, a news item appeared in a Hindi daily on April 5 regarding the release of the duo by the police after depositing Rs 6 lakh on April 1. The issue regarding non-deposit of Rs 4 lakh was also highlighted. Then the deputy commissioner asked the SHO in this regard. The then SHO clarified that the confessional statement was taken from him by the DC on April 4. When contacted, DC said the original confessional statement had been sent to project director, Sarva Shiksha Abhiyan. He said a photocopy of the statement was sent to the SSP when he was asked to get an FIR registered against them. The Judicial Magistrate said many instances had come to light where the complainants were not bonafide and had been filed with an oblique motive. The magistrate termed the case as a classic example for such an instance. Kanwalpreet Kaur of Model Town here had filed a complaint against brothers-in-law Davinder Pal Singh, Amarjeet Singh, Satwinder Singh and Gurbinder Singh, mother-in-law Gurbachan Kaur, sisters-in-law Balwinder Kaur and Jaswinder Kaur and niece Ritu under Sections 498-A in 1997. The court had quashed the names of Balwinder, Jaswinder and Ritu from the case in 2002. Kanwalpreet was married to Navjeet Singh in 1992. In her complaint, she had alleged that her in-laws were harassing her for more dowry. She had claimed that her brothers had given Rs 1.5 lakh to her in-laws in three installments. She had further alleged that she was thrown out of the house. In the order it had been said the remaining five accused were made to suffer on account of baseless and malicious allegation. To prevent such abuse of beneficial provision of Section 498-A of the IPC by women in future, the magistrate dismissed the complaint and acquitted the accused of the charges. The court directed Kanwalpreet to pay Rs 1 lakh to each of the five persons. Deputy Commissioner V.Umashanker said this scheme would benefit a large number of people, including 60,000 debt-ridden farmers who were members of the Cooperative Agriculture and Rural Development Bank (CARDB). About 8,288 persons had become members of CARDB so far and a loan worth Rs 36.15 crore was were pending against them. This included Rs 17 crore interest. Indian Oil Corporation (IOC) today got the possession of land spread over three villages for its petrochemical hub here. District revenue officer Jaidev said the land had been acquired in Baholi, Balajatan and Dadlana villages. Regarding the demands of unhappy Dadlana farmers, he said their demand for a land rate of Rs 35 lakh per acre was unfair, as the area did not fall under the NCR and the award announced for them was double than the market rate. An award of Rs 19.15 lakh per acre was announced for the acquisition of land in Dadlana. He said the farmers' demand for more time for rehabilitation had been conceded. “They can stay in their houses for about three more months till an alternative arrangement is made, but can't cultivate anything on their farm land,” he added. Residents of Mohra Mandi in Ambala Sadar are facing acute water scarcity. Local residents said they were getting inadequate water for the past couple of days. They demanded that the water supply to their area should be improved immediately. They pointed out that with the onset of summers, demand for water had gone up but the supply was not adequate to meet the requirements of the people. They said they had to stand in long queues at public taps to fill up their vessels. The residents stated that since the water supply was erratic, there were times when they had to go without water throughout the day. Gaurav, an employee of a private firm, took his wife to a doctor. He had kept the amount in the dicky of his motor cycle. When Gaurav and his wife returned after meeting the doctor, they found that the lock of the dicky had been broken and the packet containing Rs 2.20 lakh stolen. He had withdrawn the money from the Bank of India to make a payment to a firm in Jagadhari. A police official said the modus operandi of the gang was to keep a watch on people who kept large sums of money in the dickies of their two-wheelers. Then the gang members would follow the person and steal the money after the two-wheelers were left unattended. Thieves struck at a photo lab in Ambala cantt on Tuesday night. The owner of Sweety Colour Lab saw the locks of the shop broken in the morning. A sum of Rs 30,000, three digital cameras and two mobile phones were stolen.